I love an Easter egg hunt. And Easter egg baskets, filled with chocolates. 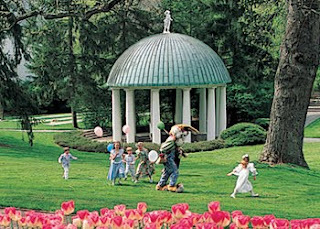 I think Easter at the Greenbrier, in the Allegheny Mountains in West Virginia, pictured above, must be pretty idyllic. "Greenious H. Brier, The Greenbrier’s very own holiday hare, to preside over the Easter Fun Fest and Egg Hunt. Live children’s theatre performance and jelly bean guessing contest. Hippity Hop Dinner Dance Party, a dinner buffet on Saturday. Easter Sunday Brunch..."